While hiking the last section of the PCT in Washington State, Omar and I talked about what challenge we ought to purse after reaching Canada. Soon our conversations centered on the possibility of running a marathon the following spring. Since Omar and Karie had already done several marathons, I relied on him to pick the one that would be the best for a novice runner like me. He suggested the LA Marathon, which he had run a couple times. The LA Marathon is held in late March and attracts 25,000 runners, most of which of are not out to set speed records. Omar said the course begins near Dodger Stadium heads west along the base of the Hollywood Hills and then southwest to the Santa Monica Pier. The course is mostly flat with few hilly sections. By the time we reached the Canadian border, Omar and I had settled on the LA Marathon. Once I got back to Durango, my first order of business was to setup an appointment with my doctor to checkout a couple minor injuries that had happened while hiking the PCT. The two most significant were a shoulder I injured in a fall and a badly sprained ankle that didn’t seem to get better. The ankle sprain occurred when I slipped on a mossy rock about 100 miles south of the Canadian border. Although my ankle really hurt, I wasn’t about to give up so close to completing the PCT. The doctor recommended physical therapy for my shoulder. She also recommended physical therapy for my ankle but suggested I get an X-ray to confirm it was nothing more than a severe sprain. The next day my doctor called with the X-ray results. Much to my surprise I had broken my fibula, the smaller bone in my lower leg. Since several weeks had elapsed, the break had partly healed. My doctor recommended I take it easy for a couple more weeks before starting my marathon training program. After a few weeks of “taking it easy” and some physical therapy, I was good as new. Although I was fit from hiking the PCT, I had never done much running and had no idea how to train for a marathon. I reached out to my friend Omar for his advice on a training program. He recommended the program he and Karrie used. It was a 16-week program that gradually builds up with longer runs each week, then backs off the last two before race day. My 16 week training schedule. This past winter in Durango was one of the snowiest on record. As a result, most of my training had to be done indoors at the Durango Community Recreation Center. The Center has a short indoor track that I used for most of my runs. On this track, thirteen laps equal one mile. For my longest run I had to complete 260 laps. It was boring, but better than running in snow and ice. Animas River Trail in the middle of February. Animas River Trail in March. What a difference a couple weeks make. The first two weeks of my training regime were difficult. Even though I was lean and in good condition, I couldn’t run more than a half-mile without slowing to a walk. After a couple weeks my body gradually adjusted, and I was able to run longer and longer distances without slowing or stopping. By the time I finished the training program, I was confident I could run a marathon. I wouldn’t set any speed records, but I knew I could do it. Omar flew to Durango the week before the race where he would join Alena and me for the drive to Los Angeles. Before leaving we completed our training programs; a couple runs along the Animas River, began carb-loading to ensure we had plenty of energy for race day, and a pub crawl to keep our arms limber for post marathon celebrations. The morning after we arrived in Los Angeles, we headed to the LA Convention Center to register and pickup our race packets. Although we arrived early, parking spots were difficult to find. Even so, everyone seemed to be in good spirits. Omar and I were especially excited to find our names on the board that listed all race participants. After picking up our packets Omar and I drove to Santa Anna to visit Juan Sanchez and his family. Juan and Omar have been good friends since they first met while in the Army serving along the DMZ in Korea. Homemade tacos and tequila where exactly what we needed in the final hours of preparation before the start of the big race. We ate and drank our fill knowing the tequila would help us the following day. Elite runners leading the pack at the starting line. Somewhere in this group is Elisha Barno who won the elite men’s division. Race day was everything and more than I expected. The crowd of 25,000 runners massed near the starting line was both intimidating and energizing. As Omar and I moved into the crowd, it slowly surged towards the starting line. 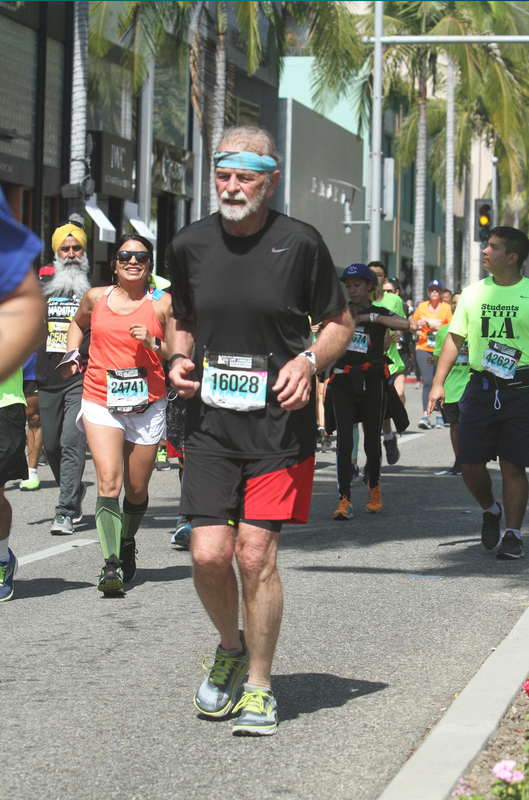 The noise and energy of the crowd became infectious as we crossed the line to begin our run to Santa Monica. The sights and sounds of 25,000 entrants running along the route were something to behold. We ran up and down the rolling hills of north Hollywood, through China Town, through the Thai community, along Hollywood Boulevard, past the shops on Rodeo Drive and down Santa Monica Boulevard towards the coast. All along the way there were thousand of spectators cheering us on and offering food and refreshments to replenish our bodies. After running for a couple hours we thought we were approaching the finish line. We soon realized we still had 15 miles to go. Somewhere near mile 18 I spotted familiar faces in the crowd. It was Alena and her cousin Statia. After a couple photos, Omar and I were on our way again. Around mile 19 I began experiencing severe cramps in my left leg. Stretching and walking a few blocks relived the cramps. So, we began running again. A mile or so later the cramps in my left leg returned, and this pattern continued for the rest of the race; leg cramps, stretch, walk, run, repeat. As a result of the reoccurring cramps, we completed the last six miles by mostly walking the course. Fortunately, I was able to walk at a good pace. Omar kept telling me that running a marathon was simple, just put one foot in front of the other. It didn’t help. Soon the course turned the corner and headed along the coast to the finish line. Knowing that my left leg would knot up like an old sailor’s rope if I tried to run, I saved my last bit of energy for a final sprint across the line. It was more of a hobble than a sprint, but I did the best I could to impress the admiring crowds. Omar was right behind me to capture my athletic achievement on his phone. After crossing the line all I could think of was WOW what an experience. It was made all the better by running alongside my good friend Omar. I know he could have left me in the dust at the starting line, and I would have not seen him again until the end. Instead, he stayed with me all the way to Santa Monica telling humorous stories that kept me in stitches and in good spirits. Come to think of it, I think I enjoyed Omar’s company and stories even more than the race itself. 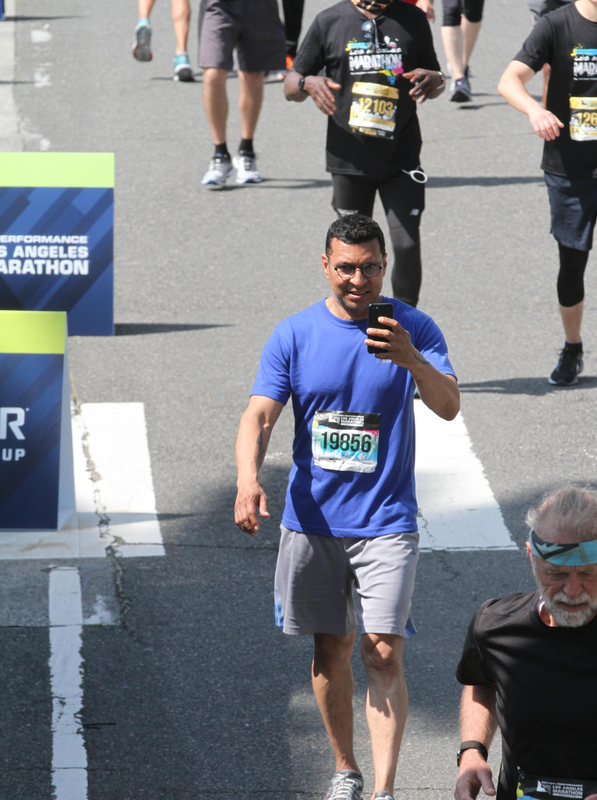 Omar filming me as I crossed the finish line.